I loved getting this video link from the Art of the Prank site run by Joey Skaggs: Banksy’s Prank TV Special: The Antics Roadshow. It was a pleasure to meet Joey at the Trespass book launch in New York — he had just the kind of bright eyes and youthful energy as the other pranksters featured in Banksy’s Antics Roadshow, which aired in the UK on Saturday. The video will make your day, just like the Art Threat post from last year on the Top 9 Political Art Projects of 2010. And how exciting that Banksy is continuing to use film to inspire; making positive connections between actions and today’s unrest. The interview I did with Shepard Fairey for Untitled Magazine it out on newstands and by subscription. You can read the full text here. The issue’s theme is fame, and there’s also a timely interview with Noam Chomsky on “the myth of the american dream”. 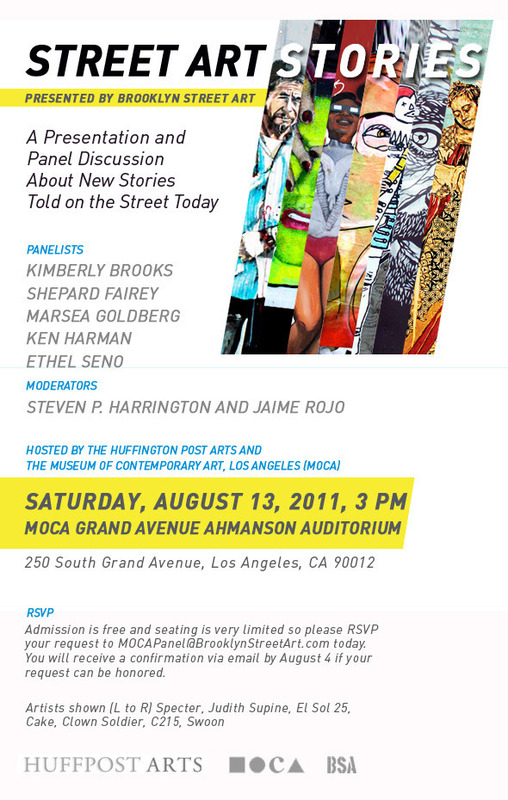 Forgive the cliche “time has really flown by” but it really has as I’ve been working as a coordinator for the upcoming Art in the Streets show at the Museum of Contemporary Art in Los Angeles. Until that exhibition opens in April, the event I’m looking forward to most is the Trespass book signing in San Francisco hosted by the Billboard Liberation Front. It’s coming up on Thursday, February 17th at 7pm at the legendary City Lights book store (the crucible for the Beat scene). I’ll be driving up from Los Angeles, and looking forward to the chance to talk about how the book came to be. 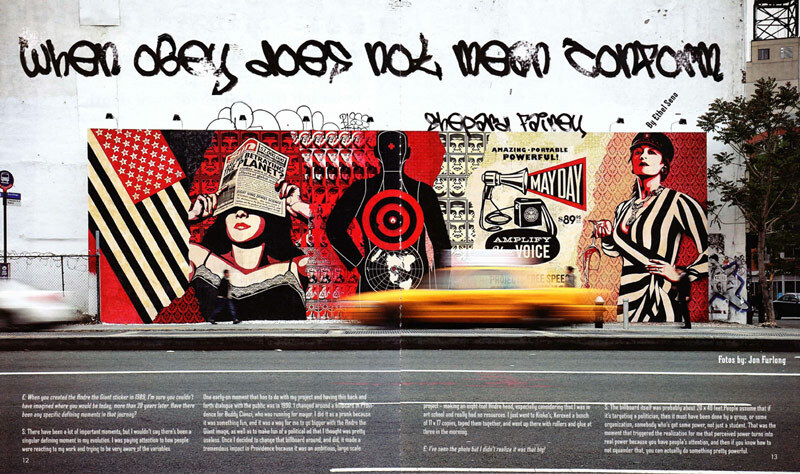 One of the points I wanted to bring up again was that “uncommissioned public art” was the book’s original title, and that is important because it reflects better than urban the proposal that street art and graffiti are a part of a larger artistic impulse to create outside the establishment. Instead of force-feeding with a definite idea what is good or in this case what is most popular for a commercial product, we featured many relatively unknown, brilliant artist and projects — I hope the experience with the book is somewhat private in so much that allows you to come to your own conclusions. I loved the comment by one artist that she didn’t want to be pigeon-holed and that’s what she liked about Trespass. It’s a long history, and we are all players so long as we keep our eyes open, which brings me back to the art of making books! 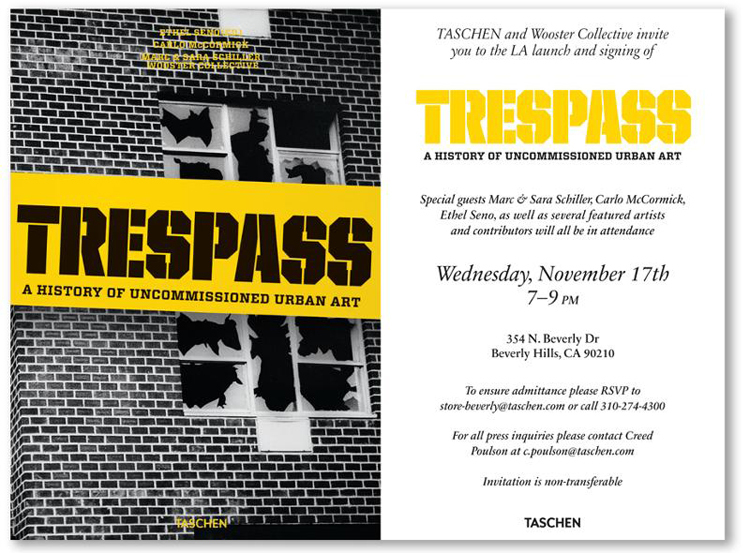 Indeed, the second official Trespass book launch and signing is coming to Los Angeles this Wednesday, November 17th at the TASCHEN store in Beverly Hills from 7-9pm. We’re looking forward to good company and a great party, and we would be thrilled if you could make it! Please click on the invite for more info including the RSVP details. “Trespass launch” tag spotted in Gurdon, Arkansas over the weekend, from our friends Bill Daniel and buZ blurr! I was happy to have Carlo, Marc and Sara in LA this time, and Susan Michals kindly wrote about the project on the Wall Street Journal’s Speakeasy, including a snapshot of Skullphone’s memorable greeting. Special thanks to artists Ron English, Chaz Bojorquez, Craig R. Stecyk III, Anthony Friedkin, Joey Krebbs, Cayetano Ferrer, Scott Oster, and everyone who came out for the evening! Subscribe for more info about the book!